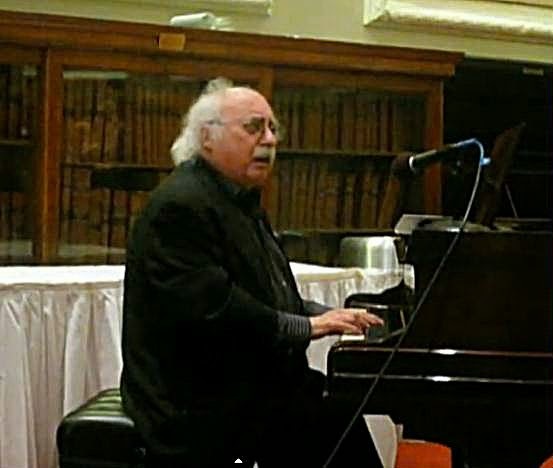 Jewish Humor Central: Ray Jessel, 84-Year-Old Jewish-Welsh Songwriter, Sings Irish-Jewish Folksong "Shirley Levine"
Ray Jessel, 84-Year-Old Jewish-Welsh Songwriter, Sings Irish-Jewish Folksong "Shirley Levine"
Jewish-Welsh songwriter Ray Jessel (not related to the late great comedian George Jessel) has been around a long time, but somehow we only found out about him today. The 84-year-old Jessel was born in Cardiff, Wales, and has been writing songs since the 1960s, including songs for the Broadway musical Baker Street about the life of Sherlock Holmes. Jessel made his cabaret debut when he turned 72, and has been writing comic and naughty songs that he performed in his own acts and on America's Got Talent earlier this year. “There were quite a number of Jews there when I grew up, about 2,000 families and three shuls,” the avuncular Jessel says by phone from his home in Los Angeles. His grandfather was one of the co-founders of the Orthodox synagogue in Cardiff, where Jessel had his bar mitzvah. “Following the Jewish tendency to be musical,” young Jessel started piano early. He earned a degree in music from the University of Wales, and won a scholarship to study composition for a year in Paris. He emigrated to Canada and served as music director for a Reform temple, writing music for the choir. He became an orchestrator/composer for CBC radio and television. In Toronto, he got involved with musical theater, and that changed his life. Jessel wrote material for “Upstairs at the Downstairs” revues in New York, and created songs for the Sherlock Holmes musical, “Baker Street,” which ran on Broadway (1965). He wrote the score for “Helzapoppin,” which premiered at the Montreal Expo in 1967. In this video clip, Jessel sings an "Irish-Jewish folksong" about a fair colleen named Shirley Levine. very funny and he started his career at 72. see, there is still hope for old people. saw him on agt on nbc and he was very funny.